There are two variations of the spelling Tregony. Tregoney was often used in the past, but Tregony is the accepted version. Tregony is a village of approximately 1000 inhabitants which is situated in the middle of the county of Cornwall in England, between the towns of Truro and St.Austell. It is located in a delightful, country area. Tregony was once known as a ‘Town’ and it was an important centre of its time. The place has a long history reaching back to pre Norman times. Today it has reverted back to being a pleasant small, rural community. The Tregony area of olden times consisted of two Parishes with a Borough implanted upon one of them. The country area to the north and the east is the ancient Parish of Cuby. 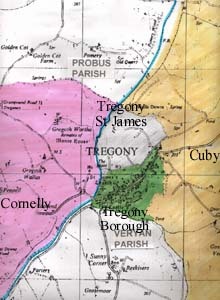 The other parish is that of Tregony St.James, which had the Borough of Tregony established within part of its boundaries. Since the 1970’s, the adjacent Parish of Cornelly has been attached to the united benefice of Tregony Church. I have been closely associated with Tregony for some 60 years and have kept in contact with relatives and the townsfolk during this time. My late mother was a native of the place and she and my father lived there for the last 30 years. My interest started with family history and soon evolved into local history. I started to research and record information and to copy the photographs of events, people and places of the past and present. Old photographs and post cards taken in the late 19th and early 20th centuries were especially interesting and revealing. Fortunately, Tregony, had its own professional photographer from the 1890’s onward, and some of his work is still avaliable. In the 1960’s another resident, Mr Frank Greet, recorded his memories of life in the Village from the 1890’s. Over the years many Tregonians have emigrated to ‘foreign parts’ of the world. Imagine the amount of letters, documents, photographs and newspapers etc that must have passed to and from the ‘home town’. Even simple home produced snapshots can tell a story and help to complete the jigsaw. So you see that I am a bit of an all rounder with interests in local and family histories. Please have a look at the other parts of my site and if you have any information (even stories passed down) or documents etc that you would like to share about Tregony, I would love to hear from you. Alternatively, if you have any queries about the area or persons from here, please contact me. I AM NOT A PROFESSIONAL RESEARCHER and cannot undertake any in depth investigations, but I am willing to check the local records, in my own time. Recently I published a local history book called ‘Tregony Happenings’. For full details and availability, please click on the ‘book’ button above.